Believe it or not, graduation is almost upon us! Let’s make these weeks count, especially with our graduating seniors. Here’s an article (from the archives) to get us thinking about how to best serve seniors in their last stretch. Don’t forgot to pop back to the blog here to share about one way you plan to honor the college seniors on your campus! 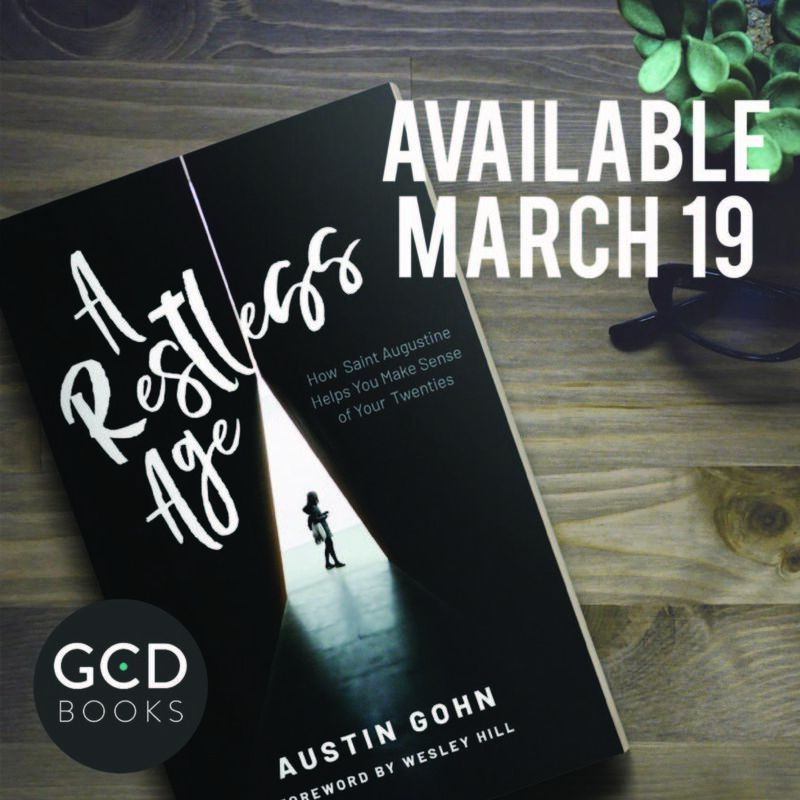 I’m so excited to have this guest post from author and young adults pastor, Austin Gohn. His book, A Restless Age, releases today! Austin does a fabulous job of bringing this ancient saint into our present cultural moment, and his book is one every person who works with twenty-somethings should pick up! See my endorsement below, grab your copy today, and enjoy Austin’s post! I graduated from college, moved, got married, and started my first full-time job all in the same summer. I had a degree in intercultural studies, but I moved right back to my hometown. It looked the same as when I left but everything felt different. I was a young adults pastor, but I felt like I was the one who needed a young adults pastor. (I was barely 23-years-old!) I was trying to navigate multiple transitions without much guidance on how to make sense of so much change at once. And, on top of it all, I couldn’t even figure out how to get WiFi in our tiny apartment. I needed someone to guide me, someone to let me know what I was feeling was normal, someone who had been where I was—and survived. And, from seven years of experience working with young adults, I have met many young adult who feel exactly the same way. A few years into young adults ministry I read Augustine’s Confessions for the second time. It’s one-part memoir, one-part devotional, and one-part theological treatise. And most of the book covers the span of time from his late teens through his early thirties. This time, as I read, I saw the book in a different light. It was no longer just required reading for one of my freshman courses. It felt like the most relevant book on the young adult years I had ever read. In Augustine’s story, as told in his Confessions, we see what it’s like to be a twenty-something—but from the inside. We see what it’s like to wrestle with doubt, to try to break the habits we hate, to try to find where we belong, to ride the rollercoaster of romance, and to nearly burnout only a few years into the career we’ve prepared our whole lives to do. While much of the young adult experience has changed since the fourth century, even more has remained the same. Reading this book not only helped me understand the young adults God had entrusted to my care, it helped me understand myself. Augustine might be the patron saint of brewers, theologians, vermin, sore eyes and printers, but he ought to be the patron saint of young adulthood. 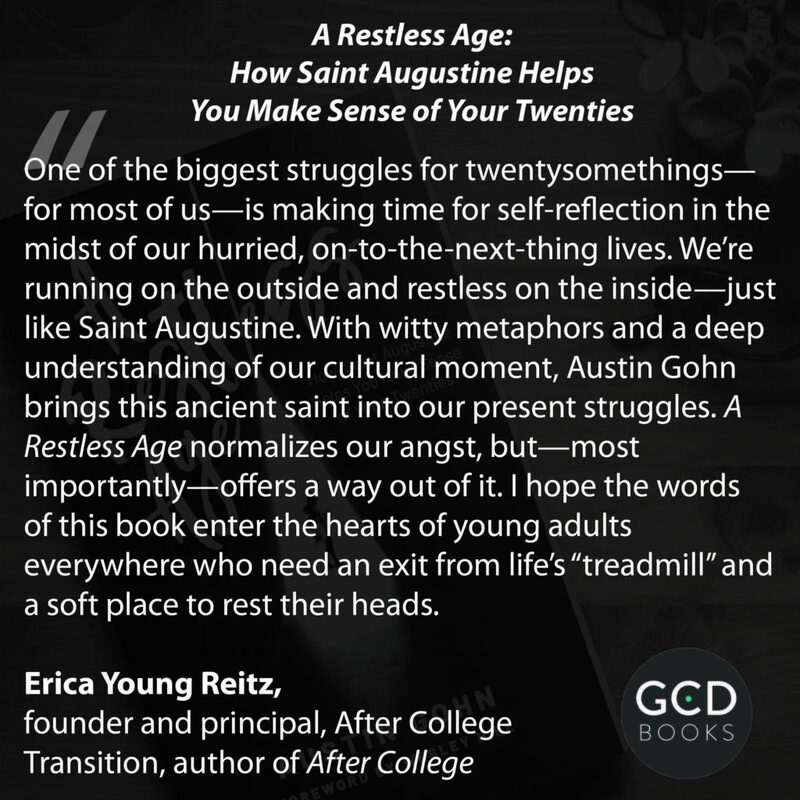 That’s why I wrote A Restless Age: How Saint Augustine Helps You Make Sense of Your Twenties. I wanted young adults to see how an ancient saint is more relevant to their lives than many of the books out there geared toward young adults. I believe that many of the young adults who take the time to wade through Augustine’s Confessions will come out saying, That’s exactly what I’m experiencing. If this book leads more young adults to engage with Augustine, it’s done its job. Augustine experienced the same five searches in his twenties, even if they looked a bit different. He tried out cults, churches, and total unbelief. He tried to quit habitual lust before it wrecked his life. He lost friends and made new friends. He was in a long-term relationship that ended with a devastating breakup. And, he moved multiple times because of multiple career changes—all before his thirty-second birthday. If you didn’t know I was describing a fourth-century theologian, you might think I was talking about any number of young adults today. I read Augustine’s Confessions for the first time when I was 19-years-old, but I skimmed it and didn’t see what it had to do with my life. I needed a book that could help me see Augustine the broken young adult, not just Augustine the saint. I wrote A Restless Age to do just that. Augustine might not provide much wisdom for how to get WiFi in your tiny apartment, but he can help you make sense of your twenties—and possibly even the rest of your life. You can order A Restless Age from Hearts and Minds Books or Amazon. 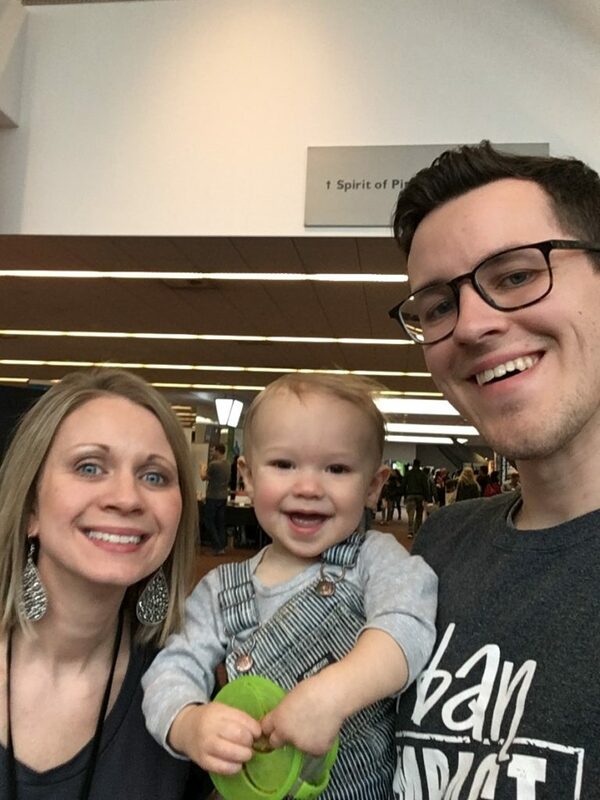 I had the honor of meeting Austin and his family at CCO’s Jubilee Conference last month. His adorable son, Levi, steals the shot in this photo! I’m curious, how have you seen “restlessness” manifest itself in the lives of the college students and recent graduates you work with? In what practical ways are you helping twenty-somethings in the “searches” Austin mentions above? Leave a comment below! 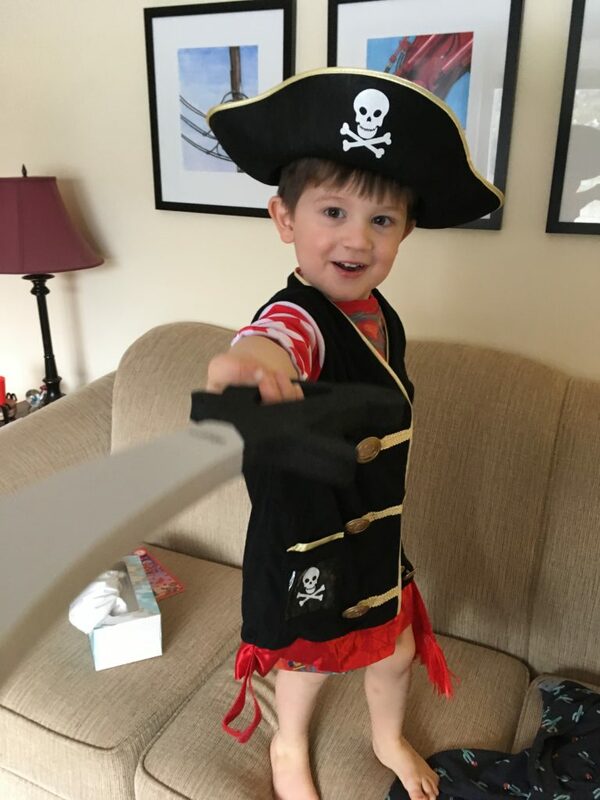 In light of my last post on pirates and child-like play, I thought this article (from the archives) would be the perfect follow-up. Can you guess what top quality makes college seniors successful in their transition and employers eager to hire? After you read the article, don’t forget to stop back to leave a comment about one thing that stands out to you or how you’re working to nourish this quality with your students! While playing an imaginary game with my four-year-old son, I slipped onto to my computer to check what felt like a very time-sensitive email at the time. He quickly caught me and chided me with these words, “Pirates don’t use computers!” He wanted us to play, have an adventure, and find the lost treasure! My screen was both anachronistic and annoying in his pirate world. So true. Though this was just moment with my child on an ordinary Tuesday, it made me think not only about how we use technology wisely but also about how well I play. With my son. And with my students. Not long after this incident, my son’s preschool teacher loaned me a short book called Play Like a Pirate by Quinn Rollins. Our little parent-teacher conference led to a conversation on pedagogy, and before you think we were taking ourselves way too seriously for a meeting about four-year-olds, I should say that our discussion was all about play! I cruised through the book, and even though Play Like a Pirate is geared towards K-12 teachers, I took away a renewed commitment to make learning as fun as possible. If we’re not having a good time, our students won’t either; if we’re bored, they’ll be bored too. Whether we’re opening the Scriptures, training our RAs, or teaching student development theory, we should be having a blast. So much so that it’s obvious and contagious. I probably won’t bring action figures or Barbie dolls to class as Rollins suggests, but I’m considering the ways that play fits into our work with college students. On a practical level, I just may bring some play-doh the next time I teach counseling theory and I have some thoughts on how I may incorporate comic strips/graphic novels in a module on diversity. The book also made me think about the time I brought a pogo stick to Senior EXIT. It was in the middle of the semester when the PA winter and the stress of classes had gotten the best of the students, and we all needed to release some tension. There’s nothing like a pogo stick to lighten the mood and let us have some fun before jumping into a serious topic. Interestingly enough, my kids and I found that pogo stick in a trash pile in front of our neighbor’s house. I usually discourage my children from picking through junk piles during bulk trash week (I promise, they’ve never come home with a used mattress or anything like that). But this was a shiny thing of beauty with its 1990s decals still clinging to the metal. They don’t make ‘em like the used to. We snagged that treasure. It may not be play-doh and pogo sticks for you, but how do you bring passion and play into your work with students? Teaching and learning with college students is an amazing privilege. I want my love for them and what I teach to shine through at each turn. This is not to say we won’t have bad days or times when we slog through or need to address tough stuff, but overall, our students should see us leading the way in our love for what we do. Because when we do, there’s all sorts of treasure to be found! I’m curious, in what practical ways do you bring passion and play into your work with students? What makes it challenging for you to do so? Leave a comment below. I want to hear from you! How Do We Best Use Social Media to Reach GenZers? I’m a sit-down-and-let’s-talk-over-tea-in-my-living-room kind of person. I don’t have social media on my phone, and I often shut off my cell on Saturdays and on vacation. I don’t have perfect relationship with technology (far from it), but as my students are trying to figure out healthy rhythms with their devices, I’m often trying to figure out how to “tithe my time” to social media. Because I believe it matters. If we want students to show up at our events, and if we want to best use technology to reach them, we need to use and understand the platforms they’re on. A recent New York Times Article on The iGen Shift quotes Corey Tressler, associate director of learning at programs at Ohio State University, who says that when it comes to students’ phones and devices, “It’s not really technology to them.” Social media is the air they breathe; they haven’t known a different way, “digital natives” as they are. So, how do we – as those who work with students – cut through the thick fog of the posts they scroll and offer a breath of fresh air? How do we best use social media to reach GenZers? My cards are on the table. I may not be the most qualified voice on how to best use social media to reach GenZers, but this question came up in the Living Training Course, and I’d love to share some things I’m learning as well as hear what’s working for you. As I was preparing to launch After College Transition, I learned from people like Jeff Walker, Pat Flynn and Donald Miller – these guys teach marketing principles, but their practices can be applied to the human experience in any sector, including the next generation of college students (iGens or GenZers). Here are a few things I’ve been thinking about. Start a conversation. No one enjoys the noise of “Come to my thing!” but people often want to share what’s on their mind, especially if it’s related to a topic they care about. I had a team member who took on the lion’s share of social media posting for our events, and he often created posts that asked questions, invited a vote, or started a conversation. Let’s say we’re planning to host a workshop about preparing for that first job out of college. Instead of repeat posts about the details of the event, we could start with a question like, “What’s the worst job you’ve ever worked and why?” Or, we can post a short quiz, invite people to fill it out on social media, and then share the results. Inviting top 5 lists are also a fun way to start a conversation. Deliver real value. If people are going to spend time and money on something we’re offering, they need to know we’re going to deliver value. We can use social media to deliver pieces of value in advance of the event, such as an article or PDF related to event we’re trying to market. A short video would be even better. In many ways, the online world is shifting from blog to vlog, and GenZers prefer interactive video to static print. * We can work to create to a crumb trail of value that leads students to right to the event we hope they’ll attend. Share a story. We are wired for story. 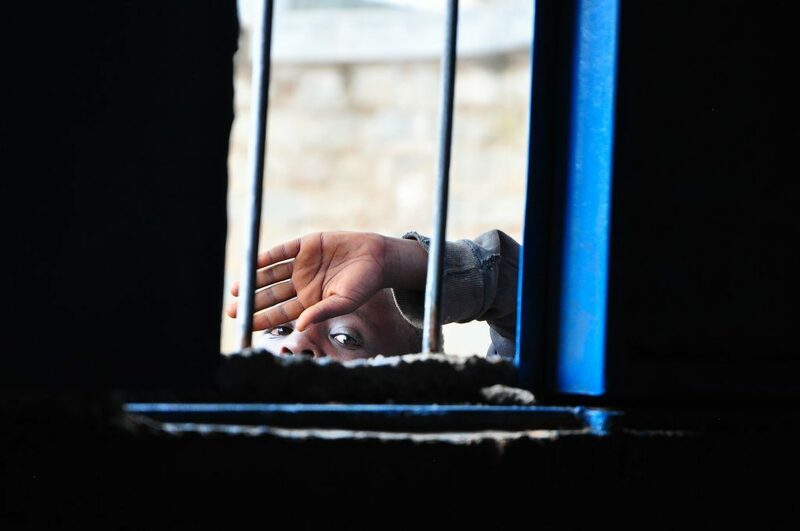 We don’t need to share an epic, but we can and should share short testimonies of changed lives. Stories inspire and also offer social proof. If we’re promoting an event and want our students to show up, let’s encourage them with stories of others who have gone before them. On our live video call last night, one participant talked about sharing part of a story…and then wrapping it up later. Cliff-hangers are a great way to keep people engaged. If you’re just getting started, make sure you capture stories from your current students. And some videos too! 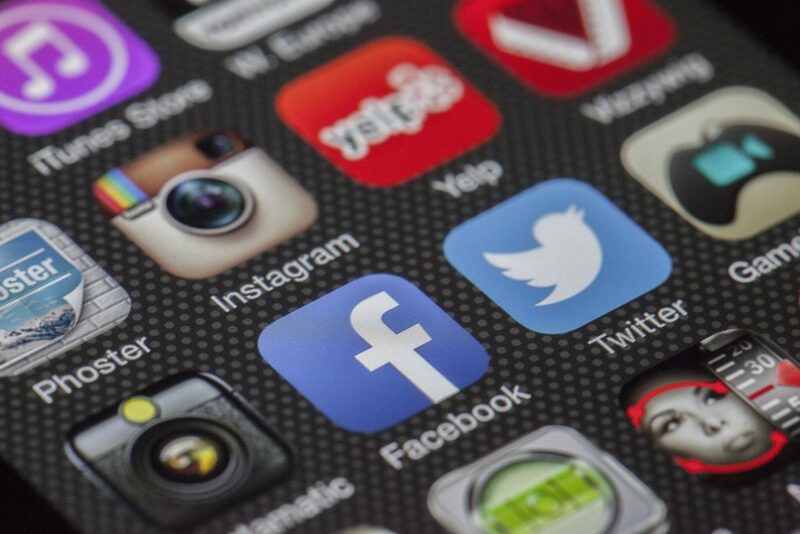 According to the article, GenZers respond to specialized apps and highly customized options; however, they’re also interested in the person behind the social media posts. They want people who are real. Human. Authentic. We should use social media to engage our students, but let’s never stop there. The number one reason students show up at anything we have to offer is because a real person they trust invited them to be there. Social media can’t replace personal invites. I’m curious, what’s worked for you or what’s failed? Leave a comment below about how you’re using social media to engage GenZers and what you’re learning. *The iGen Shift, New York Times, August 5, 2018.